Ponteland Online News: Do You Recognise This View? Yes, it is Cheviot View, the gates of The Lodge on the left place it, but it is the two school boys on bikes, the lack of traffic and the abundance of trees that are all very different from today. This picture was probably taken in the 1950s. In 1955 the road was widened, Clickem-in bridge was widened and two brick cottages, opposite Clickem-in farmhouse, were demolished to facilitate all this. Clickem-in farmhouse and the farm cottages are marked on plans from the beginning of the 1800s, and may go back further. There was also a milestone from the Turnpike days at the bridge indicating that this was 7 miles from Newcastle. Now, the question. 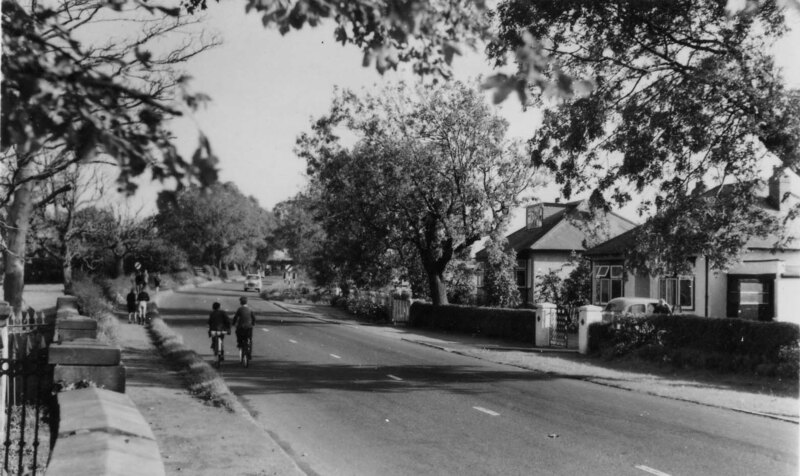 Does anyone have photographs or memories of this part of the road, from the Dobbies roundabout to Bell Villas, before 1955 when it was widened? Please contact Muriel on 01661 871969. Last month I found a formal picture of the Castle Ward Rural District Council,mounted and everyone named, just before it was consigned to history in 1973. From the Charity shop in Merton Way! !